Back when I was in school the music program asked me a few times to do some stuff for them. This time I was asked to do the usual photos down in the studio on the green screen, since they seem to love the green screen for some reason. 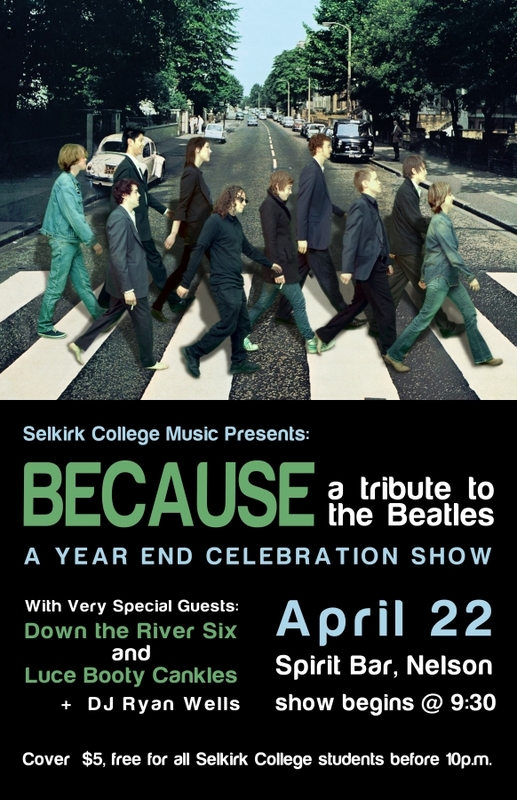 I guess they were planning one of their year end shows and had put together a Beatles tribute band. They wanted to take the background from the original Abbey Road cover and replace the original band with the music students instead. Somehow I got suckered into doing the poster as well at the chaotic time that I was trying to finish my graduating projects. This would have been a pretty easy project to do other than there apparently being no good high res scans of the original cover online. The real time killer came though when I looked at all of the photos of students that I had taken and realized that they were all really badly color cast from the green screen. I'm certainly no color correcting expert so I sat there for a ridiculous time trying to get each of them to blend as well as I could get them into the background. There's definitely some room for improvement in the photoshopping but the rest of the layout I'm relatively pleased with.